ISO-8 Recommendations are not comprehensive and by no means compulsory. There are other variations due to the role they play in both PvE and/or PvP. Other factors include the constant changing game play and landscape due to the introduction or addition or decrease in passive buffs or costume/class changes. You as the gamer must decide at the end of the day what's best for your game-play on both PvE and PvP. Opinions differs. ✔ Each character has their own battle class, strength and can be influenced by ISO III placements. ✔ PvP - Player vs Player - Demands different ISO. So choose wisely. ✔ PvE - Players vs Computer only - Appeals to casual gamers, most take Chaotic. Introduced in March 2012 when the game went public, ISO-8 or Isotope-8 is an integral part of your hero and heroine character set-up in Marvel: Avengers Alliance. ISO-8, Items are unlocked by researching various branches of the ISO research tree. 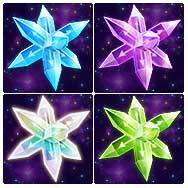 Fragments start from Level 30, Shards Level 60, Crystals at Level 100. Reactive at Level 125. Reactive ISO-8s are customized to agent level once they are slotted. Each ISO-8s are used to boost a character's statistics. They are achieved by slotting Isotopes into a hero's or agent's uniform within the team management screen. The number of slots available for an Agent depends on the uniform equipped. Six uniform categories are available, with each offering different uniforms with different power levels (or slots) as your Heroes and Agent progress through the game. Most Hero and Heroine slots has 8 vaccines. Once inserted, they stay permanent and cannot be transferred. They can be replaced by inserting another fresh set of ISO-8, subject to game play. Previous pieces that get over-written are gone once the change had been made. Prismatic ISO-8 - generalises by increasing all stats marginally. Tier V Iso-8 Research - Released on 13.03.2013. Reactive Iso-8s are now available for research for Agents level 125 and above. These can be purchased for Silver and S.H.I.E.L.D. points. Refined Reactive SO-8s can be purchased using gold only. Blaster is one of the five Classes (Generalist / Blaster / Bruiser / Infiltrator / Scrapper / Tactician) in Marvel: Avengers Alliance. It is also one of the highly favorite classes for PvP, valued for its additional firepower for both Hero Elite Bonuses as well as offensve against rivals in battles. All hits against Bruisers are guaranteed critical hits and ignore defense. Blasters are also classified with high attack, accuracy and a good amount of health but low defense. Weak against Tacticians. Bruiser is one of the five classes. It is weak against Blasters and is strong against Scrappers. Bruisers gain Enraged when attacked or hit by Scrappers. Blasters have guaranteed critical hits that ignore the Bruiser's defense. Blasters also take reduced damage from Bruisers. Scrapper is one of the five Classes in Marvel: Avengers Alliance. They perform a free follow up attack against Infiltrators. It gains Close Quarters Combat when attacking or being attacked by Infiltrators. Scrappers are also classified with having high attack and accuracy but low evasion. Infiltrator is one of the five Classes in Marvel: Avengers Alliance. It is strong against Tacticians but weak against Scrappers. It counter-attacks when being attacked by Tacticians. It gains combat reflexes when attacking or being attacked by Tacticians making that any class attacking it will counter strike back and provide bonus damage and stealth for all attacks. Infiltrators are also classified with having high accuracy and evasion but low attack, defense and health. Tactician is one of the five Classes in Marvel: Avengers Alliance. It is weak against Infiltrators and is strong against Blasters. It gains a bonus turn after attacking Blasters. Also, it takes reduced damage from Blasters. It's counter-attacked when attacking Infiltrators. Tacticians generally have good resistance. Please note that his suggestions are mostly offense oriented and made from the perspective of a Level 300 player, so it is recommended to use this guide as a reference to tweak your heroes according to your needs. For example, if you have a high accuracy bonus, and say your scrapper hero already has good accuracy to begin with, instead of using Violent Iso (Attack+Accuracy) on him, you can boost his other stats where he is lacking, maybe Powerful Iso (Health+Attack) instead. We will also be updating this guide to provide alternate suggestions. Stay tuned! is it the same pairing for alternate uniforms?